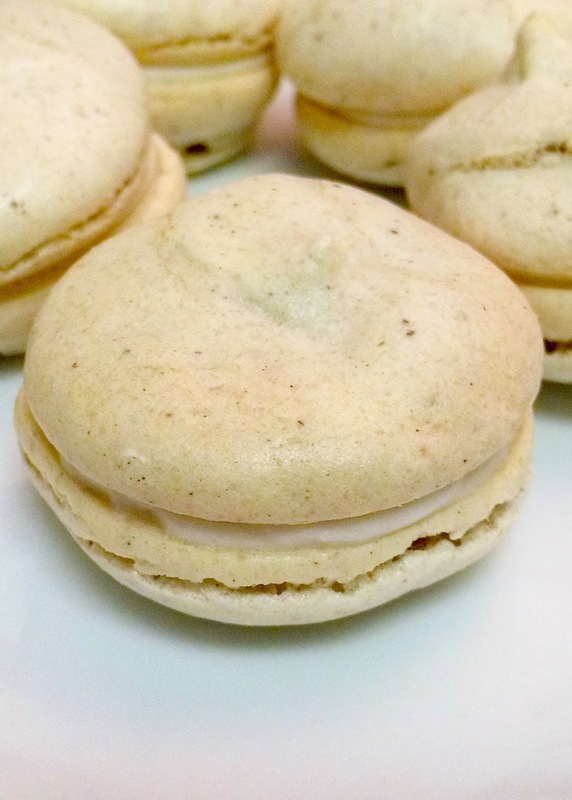 These are spicy goodness with some nice sweet and tart cream cheese filling. 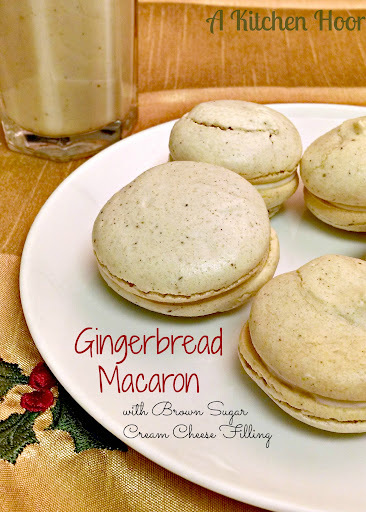 Gingerbread Macaron with Brown Sugar Cream Cheese Filling are perfect for holiday baking. Oy. The week of Holiday parties. Finally it’s behind me. The last one was Thursday. I had intended to make the Christmas pudding for this party Thursday, but just didn’t get around to it. I miss that. It’s so part of my Christmas traditions. I miss that every year. I just wish that S liked it as much as I do. Now I make it and take it to work, hoping that others will enjoy it as much as I do. I know J does. She likes fruitcake. I do, too. Honestly, it IS the predecessor to fruitcake. 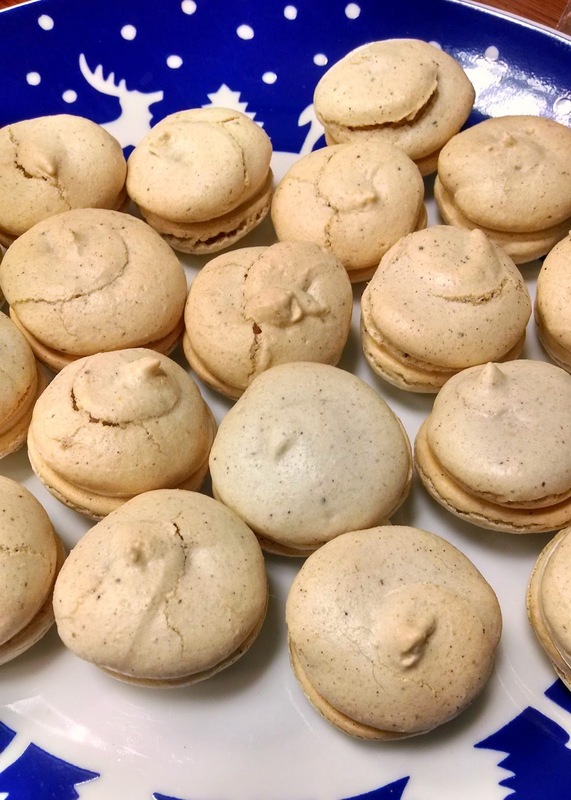 I did manage to bang out these macarons for the party. Almost everyone was asking for them. I’ve become known for baking them and have a little following. I tell people when I’m making them and that they’re in the fridge. They’re usually gone that day. I stole several of these to take home. S didn’t have any. Actually, it’s just an excuse for me to have some at home. They were just so yummy!! I have YET to master these buggers. That might have something to do with the fact that I don’t follow the same recipe each time. I think if I did, I might be more consistent. Some of these had feet, some didn’t. Some had cracked tops and some didn’t. I was trying out Mom’s gift she sent me; a macaron silicone baking mat. Sadly, I only have one baking sheet these things fit on, so it was my regular silicone mat on the normal pan and I was forced to put Mom’s new baking mat on the silicone baking sheet. Oh? I didn’t tell you? She sent me one of these from France. I think had I put this on a regular baking mat, they would have done better. I seriously need a heavy duty baking pan to accompany the one I already have. We didn’t have much luck finding a good one this weekend at Potomac Mills. Yes. We braved one of the busiest and largest malls in the area. People drive from 7 states to shop at this mall. It’s insagn. Yes. I said silicone baking sheet. It’s something Dad got me when I was living in the condo with my ex. It is an interesting concept, actually. It’s a silicone baking “pan” so to speak. The handles come out and it can roll up and store easily. You’d think it was the best of both worlds, but not really. Something about the silicone being in direct contact with heat underneath that makes it not the best baking pan. Don’t get me wrong. I love it in a pinch when I need another baking sheet. I only have those two that fit my silicone baking mats. And I just haven’t found one that I like as much as the one I have. They can’t buckle. All the others I’ve found look like they’ll buckle. If you twist them back and forth and there’s give? They’ll buckle. GUARANTEED! Yes. I’m a baking sheet snob. They just look so YUMMY!! And since I’m a spice snob and have ground all these spices fresh? O.M.G. They are UBER fantastic!! Like I said, they don’t look purdy, but my oh my they taste amazing. The cream cheese filling was even tasty as all get out!! I made a brown sugar bourbon cream cheese filling. Now, I don’t know about you, but when I go to the liquor store, I browse the minis aisle to see what’s there to try. I have found some pretty tasty ingredients for baked foods doing this. This Benchmark brown sugar bourbon is one of them. OH MY it tastes amazing!! I can’t find much on the Internet to point in the right direction. Their distributor has one website. It doesn’t list the brown sugar variety, but it is worth a try. It is rather tasty for some baked goods, maybe a caramel latte or other coffee drink? It’s just tasty and you should try it! 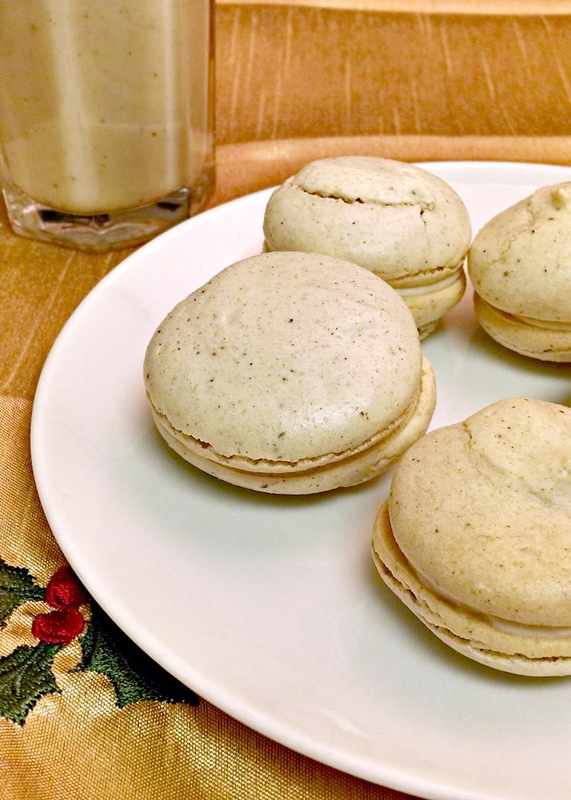 You should also try these macaron. They are spicy goodness with some nice sweet and tart cream cheese filling. In the bowl of a food processor, process the 230 grams of powdered sugar with the almonds or almond flour for 2 to 3 minutes. Sift the mixture and return any large pieces to process again. Repeat this step one more time. Sift once more and set aside. In the bowl of a stand mixer fitted with the whisk attachment, beat the egg whites 2 minutes on medium. Beat 2 minutes on medium high. Add sugar and beat on high 2 minutes. At this point, you should have a dry meringue that has clumped inside the whisk. If not, continue beating at 1 minute intervals until this consistency is achieved. Add the spices and vanilla extract and beat 1 more minute. Fold the almond mixture into the egg whites. The purpose is to deflate the egg whites, so it’s not necessary to carefully fold them. You’re looking for a thick, but not too thick consistency. It should stand when dropped and then melt after a few seconds. There are many youtube videos on what this consistency looks like. If you’re not familiar, I suggest you start with Bravetart’s instructions. Spoon half of the batter into a piping bag fitted with a 1/2 inch, round tip. Pipe 1 1/2 inch circles on a silpat lined or parchment lined baking sheet. Spoon remaining batter into piping and pipe the rest of the macarons. Thank you! I hope you do. I’m thinking of making them again this year.